GOVERNMENT OF NEW SOUTH WALES, (Sydney), Treasury note, one pound, uniface, undated (c1893), No.23409, imprint of 'Sydney: Charles Potter, Government Printer' (MVR fig196, p186). Folds and creases, pin hole top left corner, good fine and extremely rare. Due to a banking crisis in 1893, all banks in Sydney closed their doors with the exception of the Union Bank, The Bank of Australasia, the Bank of New South Wales and the City Bank of Sydney. As the banknotes from all the failed banking institutions had no value and emergency notes issued could not be trusted there resulted in a total loss of confidence by the public in banknotes. 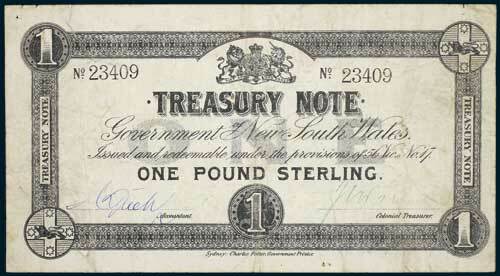 The Government of New South Wales stepped in and issued Treasury Notes (backed by the Government) as an emergency issue. Only one pound notes were issued although other denominations were projected to be printed. The act for the note issue was repealed in April 1894. Numbers 1 (Cancelled, and formerly in Mitchell Library but stolen 1978, now recovered and returned), 4, 5 and 8, are known low numbers, other higher numbers such as this one are also known. Percy Marks commented that in June 1917 Treasury Note No.1 the first issued was presented to the Treasury for payment and it was presented to the Mitchell Library by the Minister. As a method of control to prevent forgery the signatures are in different coloured ink, blue and green (the later colour was very limited and used generally in Government circles only). 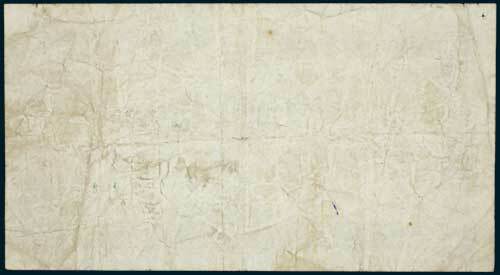 Ex Spink Australia Sale 1 (lot 129).